Bielefeld, NRW, Germany. A new version of an old shot I did a while ago out of our livingroom window. 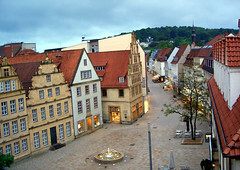 It shows the 'Alter Markt' (old market), which is the center of the historical City. This time with no people, no christmas tree, no weird reflection and just a bit more surreality due to playing with exposure, brightness and contrast. If I can remember, I'll try to do yet another one when the weather is less bielefeldy.